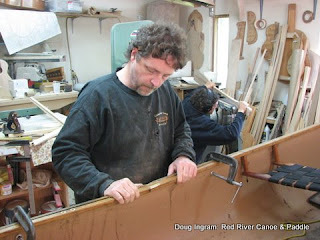 More gunnel repairs...Sometimes you need to be careful about who you lend your canoe out to. A strong, straight piece of wood needs to be clamped into place. 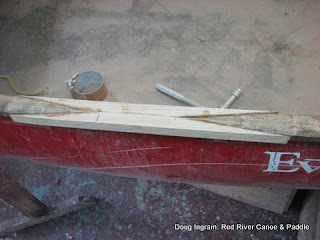 A straight piece of wood is used to make the repair, and the curve is produced by the bending force that results after the brace wood is removed. 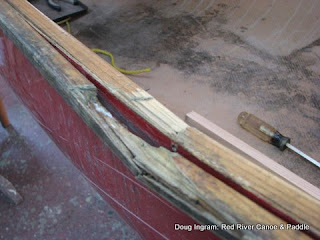 Epoxy is used to ensure that the wood repair is well bonded. Its difficult to get furniture grade joints done in these instances, so gap filling is a positive attribute. 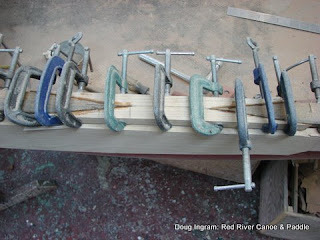 Lots of clamps are used, not to make for super clamping pressure but for an even distribution of the clamping pressure. Done, just need to clean the surfaces and sand them smooth.